Usually when we hike, we don’t run into more than a handful of people. Many times we are nearly all alone. We like that, to be honest. But on our Tuolumne to Taboose hike, we ran into a lot of people. This segment of the PCT shares roughly 210 miles with the John Muir Trail (JMT). The JMT is popular and visited by thousands of people per year. This, for us, was a unique experience in a social component kind of way. The hikers this year were not as chatty as last. Instead of getting into conversations with nearly each person we passed, we would get the polite smile, and a “Have a nice hike.” The age group this year was much older – our age or older for the most part. We also noted hikers weren’t using trail names. In fact, it seemed most hikers eschewed it. So before we found out names, we created our own trail names. We met Ozzy and Harriet, a couple from Tasmania. He was charming and quirky. She had beautiful blue eyes, was kind and liked conversation. They both had a great sense of humor. Lynn first “met” them while he was beginning the hike up Donahue Pass. They had already settled in at a campsite. She smiled and said hello when he walked by. She was putting on lotion or something and he could smell it from where he was. We ended up finding a camp site nearby as we headed north. The next day we continued walking further apart, sure that we’d never see them again. We met Deer Hunter, or Wisconsin as Lynn called him. He was a kindly man, our age, with a quick smile. We joked that we left Los Angeles back in the 1980’s because we were hearing gunfire out our back window. Deer Hunter commented the only guns he hears are during deer season. As we walked north, we also met Old School. Old School was heading south. He was taking a break on a rock at a stream. We nodded at each other. He was reading a book. Must be a day hiker. Who else would be carrying a book? He’s “old school” we thought. We moved on. An hour or more later, we were passing another stream. Across the water was a huge rock, big enough to sit up on and maybe take a break. We noticed a blue baseball cap on the rock. It had a white snowflake design and red lettering ALTA. I knew I had seen it before on a younger man. Feeling empathy for the owner of a lost hat (mine is somewhere near Silver Lake), we wondered what we should do? Leave it or take it hoping to catch up with the guy. We went ahead and picked it up and put it in Lynn’s side pack pocket. We would ask around if someone lost a hat. Over the next two days, we asked several people we met if they had lost a hat. But by the third day we were pretty convinced that we would never find the owner of the hat we found and gave up asking. Along the way, we met a slew of southbound hikers. One morning in particular, we finally really met the Tasmanian couple, Ozzy and Harriet (AKA Harvey and Betty). And we came up again with Deer Hunter (AKA Jim). Then, ten minutes after seeing Deer Hunter and Ozzy and Harriet head out from a stream we all stopped at, we saw Old School close behind. We all ended up leapfrogging each other for the next few days. At one point Deer Hunter was taking pictures and said he was photo-journaling his hike with a DSLR camera. Old School was taking pictures too, but with a film camera! Seemed our name Old School fit just right. A book and a film camera. Can’t get much more old-school than that! It was ironic that he was the youngest hiker we met. At PCT mile 888 or so, we picked up a short side trail and hiked to Lake Edison. It’s a man-made hydro-plant, lake owned by the electric company. From there we picked up a ferry to take us to VVR. We had a resupply box there. We hoped to get a good meal, collect our box and move on. The “ferry” was a little fishing boat which held four people (plus the “captain”). VVR has bigger pontoon boats but both of them were out of commission. As we approached the dock, a guy camping out along the tree line of the river said, as we passed by, that we were more than two hours early. It was early, and a little cold so we went up to the rocks that were getting sun. Eventually, we saw others had approached the dock below, but didn’t think much of it. But then we thought, hey, why are they are standing in line? We went down pretty quick after that and sure enough, people were lining up for that “ferry” and we lost our place in front. How foolish! By then, the boat had already arrived and took the first four, and now we were fourth and fifth in line for the next rides. We felt the whole day would be spent getting over to the VVR. Lynn especially was annoyed that this was happening. But suddenly, the guy who yelled out earlier that we were early, volunteered to give up his space for Lynn so that “the couple wouldn’t be split up.” We later learned this was Shaun. He was the only PCT hiker we met. He was doing a thru-hike. And he had a trail name from the Appalachian Trail that he completed last year, but he wasn’t really using it. It was “NTN” – No Trail Name. He had to get off the PCT when he ruptured his Achilles tendon. He was placed on blood thinners and had to suspend his PCT thru-hike for three months. He originally was NOBO but after this delay became SOBO and was headed to Wrightwood to finish up. While at VVR, we also finally formally met Old School. He just landed a job near the same town as Deer Hunter lives. Later at Vermilion Valley Resort, VVR, sitting next to Old School, we commented about his book. You know, when on the trail, if you want a book, get a digital copy. Or xerox the chapter you want. I used to read up on sections we were preparing to do and make a copy of the chapter to carry along. But, he said he now knows every tree on the trail. Before we even saw that Old School was at VVR, we found Harvey and Betty. She approached us while we were going through our resupply box. She was very motherly and beautiful and even offered to share the cost of one of the hotel 4-bed rooms that they took. They were hoping to find two others to share the cost. But we preferred to stay in our tent and declined. Camping was free there to hikers. Although I had my regrets later as it was really noisy at night with three different parties going on late into the night. At 1 am I was quickly reminded why I don’t like sleeping in campgrounds. Lunch was served at about 11:30. The menu at the VVR is limited. But the food is really very good. We had offered Shaun a beer for his generosity but at the VVR, your first drink, even if that is a beer, is free. It’s a perfect marketing tool and is very effective. So, instead of the beer, we bought him lunch and we got acquainted. By the time we ordered, Brian came around bumping fists with Shaun. And Brian had someone with him, whose name we didn’t know. He became “Not Brian” when the waitress handed a plate to him and said “Brian” to which he replied, “I’m Not Brian.” We also ended up having dinner with them, and a lot of beers and laughs! We noticed when we first walked up to the general store to check in that there were two hiker boxes. These were marked “Food” and “Non Food.” Knowing that the hat we found would never be back with its owner, we threw the cap into the Non Food box hoping that it would be used by somebody eventually. Once we got set up and had eaten, we decided to play a round of cribbage using a board we saw in the store “library.” We took our game to one of the outside picnic tables. A few minutes into our game, Old School approached us. We chatted about his reccent college graduation, his new job, his time he was taking to travel before moving to Wisconsin, and how he will be close to Patti’s home town at the border of Iowa. After a while, this couple, Andrew and Becca, came up to us. “There couldn’t possibly be two hats like this?! ?” Old School speculated. So that’s the story of the hat and the happy owner who got it back. Old School’s name is Tim. Tim and Andrew and Becca are friends. Andrew wasn’t feeling well, so he was going off trail, but Tim and Becca planned on moving on with their hike to Mt. Whitney. Andrew would take their car and meet them when possible at the end of the daily hikes, but eventually meet them and pick them up when they completed Mt. Whitney. The next day, they gave us a ride to the trail head at Bear Creek Trail, which was an alternate route out of VVR to reconnect with the PCT. Because this was not part of the PCT, we didn’t have any GPS and we didn’t have paper maps, either. Tim was quickly ahead of us on Bear Creek. But Becca, unsure of the trail, was a bit behind. Often we would catch up to her and discuss assurances we were on the right trail. There were places when the trail was not so clearly defined. We often feel relief when we see a PCT marker on the trail. Having been lost plenty of times that sign becomes our security. Becca was dubbed Trail Sign, when we saw her ahead we knew we were still on the right trail. At some point she got ahead and out of sight. When we reached the juncture, it just so happened that Tim was finishing up a break there and getting ready to leave when he heard two people talking and saw it was us. He told us Becca was a little worried about us.“Well, you can tell her we made it!” I said cheerfully. I thought it was sweet that she was worried a bit. Tim said they were going to stop at Marie Lake, another six miles away. We hadn’t had lunch and knew we didn’t have another six miles in us. But, still, I thought we would catch up eventually. We made four more miles that day and never did we see either of them again. Right along PCT mile 855 the trail passes over the San Joaquin River. We wanted to camp near water that night to wash off before bed and found a nice site right over the bridge. There were several groups of hikers/campers in the area, so when we saw some smoke come up through the river valley, we just assumed it was smoke from a campfire, which, by the way, was not allowed this year in the Sierra. But then we realized that was a lot of smoke for a campfire and realized it was smoke from a forest fire. But how far away? Lynn got to talking to a hiker who was just coming up from the north where we just came from, and said he hadn’t noticed the smoke. But as soon as that was going on a helicopter started circling around the area. It circled some more and then it focused on a small plot of land to the south and slowly and with amazing exactness, the helicopter landed right there in an incredible small patch of open forest. It was a LifeFlight. The EMT that came out was in full garb. Lynn just assumed they were here about the forest fire, hoping they weren’t kicking us off trail. But instead the EMT was looking around for a woman who hit her SPOT (a satellite-enabled emergency response system) because she broke her wrist. She said she was near a bridge and needed help. The EMT scoured the area, asking each of us groups of hikers, and, then satisfied this wasn’t the place, moved on. But not before the EMT told Lynn that the fire wasn’t a worry and the smoke would dissipate. One of the last people we met on the trail this trip is a sweetest couple from the Bay area. By this time we found out everyone’s names and gave up on trail names. This couple we leapfrogged a couple of times the last three days. Karine and Oliver, like us, were booted off the trail last year because of the smoke and were back this year, like us, to finish it. It was Oliver who suggested he take a photo of us on our anniversary in front of Wanda Lake. Then they decided to pose “just like us” below. Oliver also reached out to us in an email, which I read when we started working on this post! Karine and Oliver posing as we did in front of Wanda Lake on our 29th anniversary. On our last day of the trail, we were on the south side of Mather Pass heading to Taboose. All morning I often thought of Tim. I had wished when we last saw him at the juncture of Bear Creek and PCT/JMT that I knew then we would not see him again. I’m a hugger and certainly would have given a proper hug goodbye. I had just assumed we would keep leap frogging. In a way, the universe connects dots for us. When we approached the turn-off at PCT mile 810 or so, there was a big rock with a piece of paper on it held down by a small rock. It was a note from Tim. To top off the story of connections and small worlds: as we discussed in Part 1 of this series, we were lucky enough to meet a woman hiking alone near the top of Taboose Pass right before the rocky and very challenging descent to the trail head below. She offered a ride to us from the trail head into Lone Pine, a fair distance. Her husband and kids would be picking her up. As it turned out, her husband worked for the Law Enforcement Department of the Forest Service and the EMT Lynn met the few nights before looking for the hiker with the broken wrist, in fact, worked under his supervision! Patti and I have been in Southern California since the 1980’s and never have we seen a drought as bad as the one we are in now. I know that it’s a desert here, and I know that drought isn’t new here. I remember as a kid watching Johnny Carson one hot summer night in Iowa, and in his monologue Johnny was bemoaning mandatory water savings. Shower with my wife??? he joked. “Have you seen my wife?” he jabbed. The current drought in California has pretty much decimated most of the water sources along the PCT, at least as far north as Mt Whitney. That’s near where Patti and I most recently hiked an eight-day, 105-mile segment from Horseshoe Meadows to Walker Pass. We had very few opportunities to collect good water and many of them were contaminated. Luckily, we had good water reports and came prepared. But water played a huge role in this hike, perhaps more so than any other we have done. In fact, the decision to do this segment rather than doing a section of the Mojave Desert, came about entirely because the water reports were even more dire in that section than the one we ended up doing. There, most of all of the water sources were dry and had been for quite some time. Water weighs eight pounds per gallon. Guidelines for water intake on the trail probably average around a gallon to a gallon and a half (or about four-liters to six-liters) per day. Patti and I hike on average about 12-miles per day. So, if water sources are greater than 12 or so miles apart, we need to carry even more than that gallon. Recommendations vary widely but this is the guideline we normally follow. When we arrived at Horseshoe Meadows, we had all our water bladders full. About a mile into the Trail Pass route from the campground to the PCT cut-off south (at about PCT mile 745), we found a small creek with water flowing but iced over. I hated like heck passing over that water knowing that water in general was going to be tough to find, but we had what we currently needed and we moved on. We found Diaz Creek at approximately PCT mile 741, a few hours later. The sun was hot and the air dry, so and we had been drinking our water. Knowing that the next water source was dubious, we chose to fill our bladders again. Reports indicated the next few sources were either likely dry or contaminated by cows in the area. We did see evidence of cows in the area, though we didn’t see any. Diaz Creek, while flowing, was very low. The water channel I slid down into was evidence of how much water was not there. Patti stayed above and began to prepare our lunch. The creek was about a third mile from the trail. And not until I was literally right on top of it did I know for sure that I would even find water. The water was reasonably clean and it was gloriously cold. Once we filtered it, it was very good tasting. Patti enjoyed her Via coffee. I decided I might try to taper my coffee usage a bit. Secretly, I worried about the water and didn’t want to use it up on coffee. We were still at about 8,000-feet elevation on the third day of the trip, but we began to descend a little and it became easier to hike. However, water remained a scarce commodity. At mile 736, there was a side trail to a corral and stream. But we followed it for more than a third mile and we never found the corral. We did, however, see four opportunities to collect pooled water. We didn’t find any flowing water, but we did manage to find enough to fill our bladders. We had lunch and moved on. I felt a little defeated having found such poor quality water and with few good prospects in our near future. 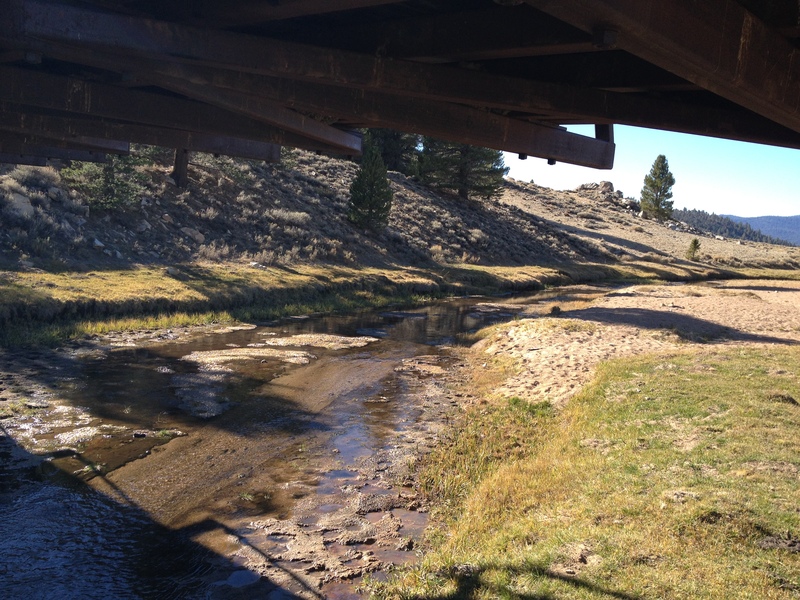 At mile 716, we came to the wooden bridge at the South Fork Kern River. We had seen the water from miles away while we hiked into the canyon that the river ran through. I felt so relieved to know that water was there. We just had to get there. Once at the bridge, Patti and I settled beneath it on the shore of the north side and ate our first hot meal in two days. Our hot meals required that we use water to rehydrate the food. So we had been eating jerky and other dry food for the last couple of days. We boiled water and ate a rice meal and ate dried apricots for dessert. A little trail mix after and we both felt well nourished and ready to go and off we went. At mile 702, we knew we would have water available at Kennedy Meadows Campground. There, we found a spigot serving clean, clear water. A nice reprieve from having to work on our water situation. The next day, after camping one night with Swept Away, we had to collect water from Pine Creek at mile 698. 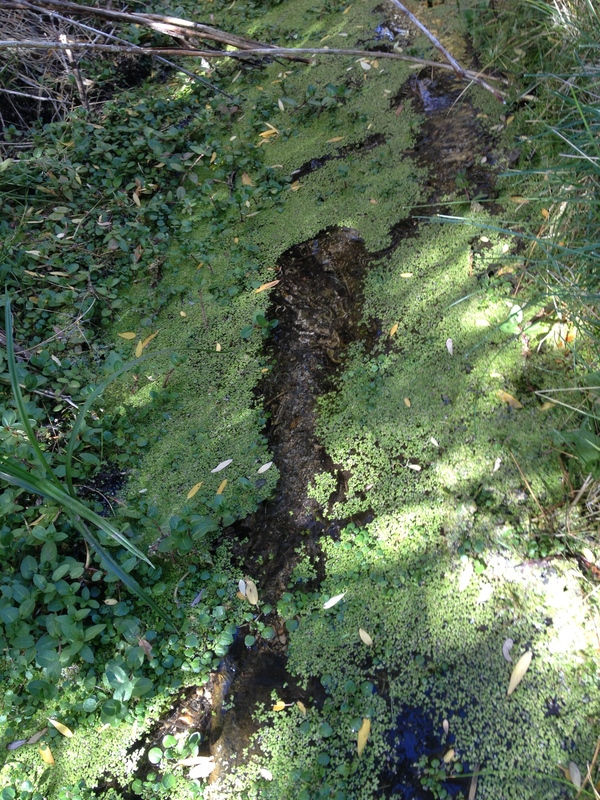 The water was green, topped with debris and a slow flow. But we filled up and rehydrated. Again, our next sources were questionable. Our next good water source wasn’t so good. At mile 683 we came across the seasonal Fox Mill Spring, a pipe running from the ground into a trough. The water was clear, but it tasted rusty even after filtering. We didn’t have a lot of options, though. We had used up not all but most of the water we had collected previously. At mile 681 we came up to the Chimney Creek Campground turn off. We were delighted to find a small cache in a Home Depot bucket dug into the ground. Patti cheered when she found Snicker Bars in it, but I was even more pleased to find water bottles. We each took a bottle and Patti took one Snickers Bar. We also decided to leave some food as a trade. We weren’t sure if Chimney Creek Campground would have water or not. The sign indicated that water is turned off sometime between middle September and early October. As it was already getting to be mid-October, I wasn’t hopeful. I left Patti at the turn off, took our empty bladders and hiked to the campground. It was a quarter mile to the entrance. From there, I hiked an additional mile or so to campsite #36 to the only water source in the park, a spigot from the well. Luckily and thankfully, I found that the water was still on. As we entered our final phase of the hike, we had fairly good prospects of finding water but we weren’t sure exactly where. Our water reports indicated that within a few miles of each other, we would find three opportunities from the same creek. We would be crossing over the Spanish Needle Creek on three occasions. The first crossing was mostly dry. However, I did see that the soil was a little moist and there was even some mud just a few inches under the brush. 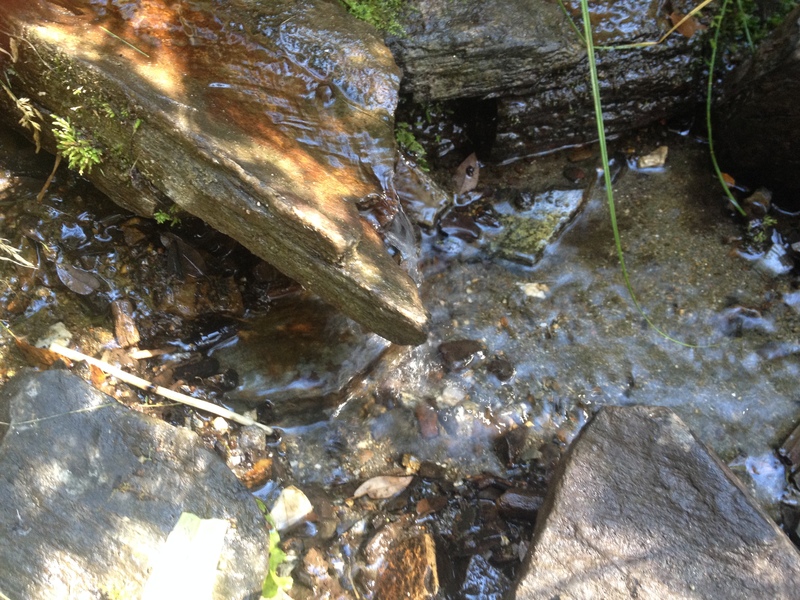 But on the second crossing, we found a beautifully free flowing source and we drank as much water as we could. This water was especially important to us as we had been feeling parched. This water would take us into our final leg and would be enough to get us to our car at Walker Pass. Once at Walker Pass, we discovered that between us, we had only a half-liter of water left. We cut it close but we made it. Never has water played as big a role in our hike as it did on this trip. We never lose sight of the fact that without water, we could not hike as we do. As I write this, in the comfort of my living room at home, sipping my ice water, I still smell the lingering fresh scent of the rain we received last night. It is the first real moisture we have received in Southern California for many, many months. Here’s to wishing for a rainy, reservoir-filling winter. We in California, and hikers of the PCT, most certainly need it.